A. Hardy Roper, author of The Garhole Bar, and Assassination in Galveston stopped by today with a photo taken last year during his book signing event. Most of us are sporting his snazzy Garhole Bar T-shirts. 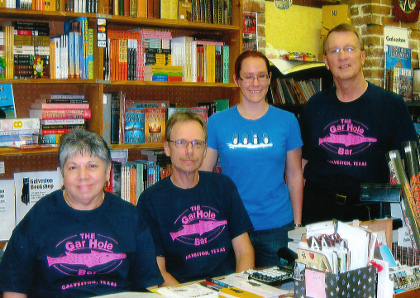 Left to right: Sharan Zwick (store owner), Paul Randall, Kathleen Panas, and Hardy Roper. Mr. Roper got some great coverage in this month’s issue of Galveston Monthly magazine, with a 2 page spread and interview.